Want to learn how to start a cake business from home, but don't know where to begin? You're not alone. Inspired by popular TV shows like The Great British Bake Off, more and more people are discovering the joy of home baking, with growing numbers looking to earn an additional income by selling baked goods from home. But how easy is it to turn a love of baking into a profitable part-time business? The number of home-based bakers in the UK is increasing all the time, and the competition is becoming increasingly fierce. Joining Mums Bake Cakes will give you the advantage of being part of the UK's largest baker marketplace and will help you set up an online cake shop quickly and easily, but there's a few other things you need to know in order to make your part-time cake business a success. What equipment and skills do you need to start a cake business? Do you need a food hygiene certificate? What about insurance? These are the kind of questions you need to be able to answer in order to turn your passion for baking cakes into a profitable home-based baking business. Finding all the information you need can take a lot of time and effort, but the lovely folks at Mums Bake Cakes have done all the legwork for you! This handy guide will tell you everything you need to know to set up and run a baking business from home. Ready? Let's jump in. When you start a business you need to inform HMRC you’re self-employed so that they're aware that you need to pay tax through the Self Assessment tax system. You need to do this even if you’re going to be running your home baking business part-time or if you have another job. In order to register as a self-employed baker, you’ll need to register for a GOV.UK Verify account. A GOV.UK Verify account gives you access to the government’s range of online services, including HMRC’s Self Assessment portal. Once you've created an account, you’ll need to provide some basic details about yourself and your cake business, including contact details and the type of work that you carry out. You’ll also need to decide on a name for your business. Before deciding on a name, it’s a good idea to search online to make sure that there are no other baking businesses using the same name. To quickly check various social media sites for your potential business name, you can use a service such as Namechk. When do I need to register as self-employed? You need to register as self-employed by the 5th October of your second trading year. If you fail to do so by this deadline you could receive a fine, so you should aim to register as self-employed at your earliest opportunity. Do I need to register as a sole trader? Although being self-employed doesn’t necessarily mean you’re a sole trader, the majority of people looking to make money from selling cakes set up as sole traders because it's the quickest and easiest way to get started. If you decide to start your home baking business with a business partner, you'll need to register as a self-employed partner rather than as a sole trader. If you decide to set up a limited company instead (which has many benefits, as well as a few drawbacks), things become a bit more complicated: you’ll be considered both an owner of a company as well as its employee. Your tax and National Insurance calculation will also be different as a result. More information on setting up a limited company and choosing the right accountant can be found at the end of the article. If you live in rented accommodation, you'll need to obtain permission from your landlord to run your baking business from home. However, the law stipulates that your landlord can't unreasonably withhold or delay their permission. If you own your home, you may need to get permission from your mortgage lender to run a cake business from home. If you're a sole trader, you have the choice of using your own personal account or opening a separate business bank account for your business. We highly recommend that you choose the latter, as it makes it much easier to work out your cashflow and calculate your tax liability at the end of the year. When your love of baking becomes a second income, you need to consider your costs. How much will your ingredients cost? What about the gas/electricity? And of course, you also need to consider the cost of delivering your handmade creations to customers in your local area. When pricing up your cakes, you'll also need to factor in how much money you need to pay yourself for the work. This is something that a lot of bakers don't take into consideration when working out how much their business will cost to run. At the end of this guide you'll find some handy tips for choosing the right accountant for your business, but many home-based bakers are able to manage their finances through simple bookkeeping and putting time aside each week to monitor income and expenditure. Make sure you record all of the expenses you incur when running your baking business. Cake boxes, ingredients, ribbon, cupcake cases, boards, electricity/gas and marketing costs all need to be accounted for. There are also a number of "hidden" costs involved in selling baked goods from home, such as fuel (for delivering your cakes) and time spent baking, cake decorating, washing up and delivering orders. Even bookkeeping time can be accounted for in your costs. Working out how much your home-based baking business will cost to run will take a bit of time, but the clever folks over at Bake This Happen have done all the hard work for you. For a one-time fee of £20.50, you can download their Cake Pricing Plus toolbox, which will give you everything you need to make pricing up your cakes and calculating your costs a piece of cake. Cake Pricing Plus includes a cake pricing calculator and PDF ebook, price-checker spreadsheet, cake costs spreadsheet, time and overheads spreadsheet and a quick-reference cake pricing spreadsheet. They also throw in a marketing guide and checklist, numerous marketing templates and even a series of how-to videos! The whole package offers excellent value for money and will help you work out your costs in no time. When you're setting up a food-related business, you're legally obliged to register your premises with the local authority's environmental health service at least 28 days before you start trading. There's no registration fee and your request can't be refused, but someone from the local council may come to your home and ensure your food preparation area is suitable. To get the contact details for your local authority, use the food business registration tool on the government’s website. You can also view our video on how to register your baking business. Although a food hygiene certificate isn't compulsory, it's strongly recommended by the Food Standards Agency (FSA) and other official bodies. Food hygiene and safety is just as important for self-employed bakers working from home as it is for the largest restaurant chains, and a Food Hygiene & Safety certificate will show your customers that you care about their safety and will help to build consumer confidence in your brand. There are numerous online training courses which allow you to learn the basics of food hygiene at your own pace and in an environment that suits you. Many of these courses can be completed within two to three hours, and some even provide a digital certificate to download once you have completed the training course. The price of these training courses can range from £15 right up to £125. Darlington Council have also produced an excellent food safety pack for home bakers. Business insurance is an important consideration when you're setting up your home-based baking business. Public liability insurance and product liability insurance (usually sold together) can cover you if someone becomes ill after eating one of your cakes, or if you accidentally damage a customer's property when delivering your cakes. Some bakers specialise in allergy baking, and this is an area the local authority's inspectors will question you about when they visit. It's important to ensure there's no cross-contamination between ingredients when baking allergy-friendly cakes, so you'll need a separate food preparation area for these. Gluten-free and vegan cakes are extremely popular on Mums Bake Cakes, so this is something you may want to consider. There are also a number of regions throughout the UK where we need more bakers baking eggless cakes, so that's something else worth thinking about! If you need any advice on the type of cakes that sell particularly well in your area, please get in touch and we'll be happy to help. When deciding what type of cakes to include in your Mums Bake Cakes shop, the best bit of advice we can give you is to be unique. Offer something different and stand out from the crowd. Some of our bakers can bake any type of cake you can think of, while others specialise in selling cupcakes from home. Some only bake gluten-free cupcakes, while others focus on creating amazing wedding cakes. You may want to start your business with a basic range of vanilla and chocolate cupcakes and then expand the range as your cake baking business becomes more successful. Whatever you decide to bake, bake something awesome! Your cakes are the star of the show; they're the reason people visit your Mums Bake Cakes shop in the first place. Choosing the right cake recipes to use, therefore, is vital to the success of your home-based baking business. Test out your recipes on family and friends and ask for their honest feedback so that you can make the necessary improvements before advertising them in your online cake shop. Repeat this process until your cakes are the best they can be and are the most delicious cakes you've ever tasted! There are countless free cake recipes available online, but if you're serious about baking amazing cakes it may be worth investing in a good cake recipe book. The best-selling cake baking books on Amazon is a great place to start. Before you can start selling baked goods online, you'll need the right equipment. If you love baking enough to turn it into a part-time business, there's a good chance you'll already have most of the equipment you need. But there are a few things you may need to purchase. Stock control for a home cake business doesn't have to be a complex process that involves hours of work. Essentially, you just need to ensure that your ingredients don't go out of date, and that you maintain accurate records of where items were purchased. A simple spreadsheet will be sufficient for most bakers selling cakes from home, but you may want to invest in a simple stock management system as your business grows. What's the difference between the most scrumptious cakes that earn rave reviews on social media, and those that are just "OK" and get the odd like or retweet? More often than not, it's simply how they're presented. Turn up at your customer's home with an eye-catching cake box bursting with personality, and your humble birthday cake could well find itself splashed all over social media, with cries of "you must try this cake" acting as ringing endorsements of your culinary prowess. Turn up with the same cake in a tatty old box, on the other hand, and the reaction is likely to be very different. It's all about perception. If you lack the necessary skills to craft a memorable brand image for your business, there are numerous ways to connect with talented freelance graphic designers. Online services such as 99designs and Upwork offer an affordable way to collaborate with award-winning logo and packaging designers, while university graduates and art college students are always looking for freelance work. If you're struggling to come up with ideas for your packaging, the blog post "50 Deliciously Creative Bakery & Cake Packaging Designs" should get your creative juices flowing. Learning how to take high-quality photographs of your cakes is one of the best things you can do for your baking business. People eat with their eyes, and by taking the time to learn the basics of food photography you'll be able to make your cakes look as good as they taste. We've put together a quick video tutorial on how to take high-quality photos of your cakes to help you get the basics down, but this is just scratching the surface. We'll be creating an in-depth guide to photographing cakes in the near future, but for now here's a few things to keep in mind when snapping your lovely cakes. Location: Think about where you photograph your cakes. Find a clear, well-lit space in your home that you can reserve for taking photos of your creations. Make sure there's no other items in your photos to take attention away from your creations, and consider using backgrounds for your photographs, such as these beautiful wooden backdrops by Ink and Elm. Lighting: Probably the most important thing to get right, and often the hardest. Lighting can make or break a cake photo. The key thing to remember is that natural light (from the sun) is always best. It can be elusive and finicky at times, but it out-performs artificial light sources no matter how sophisticated and expensive they may be. Equipment: Invest in a good camera and a sturdy tripod. Yes, your smartphone has a camera, but it's simply not up to the job of creating professional-quality photographs of your beautifully crafted cakes. A quality camera will enable you to take high-resolution images of your baked goods that can be used in magazines and on leaflets and business cards, and it will soon pay for itself many times over in cake sales. If you want to take your food photography to the next level, Tasty Food Photography by Pinch of Yum contains everything you'll ever need to know about making your cakes look as good as they taste. Beautifully presented and jam-packed with awesome tips and tricks for taking amazing photos, it's worth every penny. The eBook can be read on any device and comes with over 30 video tutorials to help you take awesome photos in no time. You've registered with HMRC and your local authority, set up a business bank account, purchased insurance cover and decided what type of cakes you're going to sell. Now comes the exciting part: registering with Mums Bake Cakes! The first thing you need to do is visit our "Become a Baker" page and pop your email address and postcode into the registration form at the bottom of the page. Once you've sent us your details, we'll ask to see a copy of your insurance certificate and will contact your local authority to ensure that your baking business has been registered. Once the formalities have been concluded, we'll switch on your store and send you a Mums Bake Cakes welcome pack. Inside the pack you'll find lots of useful information, message cards, ingredients cards and a "While you were out card" that you can pop through the letterbox if the recipient isn't at home. Starting your baking business with Mums Bakes Cakes couldn't be simpler. And it really is the best way to get your scrumptious cakes noticed by the nation. Once you've got access to your Mums Bake Cakes account, you'll be able to upload photos of your cakes, specify your delivery areas, set your own prices, write descriptions for your products and list the ingredients in your mouth-watering creations. We've put a lot of time and effort into making Mums Bake Cakes as easy to use as possible, and filling your shop with delicious birthday cakes, wedding cakes, novelty cakes, cupcakes and more should take no time at all. However, if you invest a bit of time in writing enticing product descriptions and learning how to take high quality photos of your cakes, your products will sell like, well, hot cakes! One of the main benefits of setting up an online cake shop on Mums Bake Cakes is that we're constantly promoting the site to a nationwide and international audience. We help more bakers get their cakes in front of more cake-lovers than anyone else in the UK, and we're growing every day. However, there are number of things you can do to promote your Mums Bake Cakes shop and help get even more exposure for your cakes. The marketing tips listed below will help you grow your home baking business even quicker and get your oven working overtime! High-quality photographs: We touched on the subject earlier, but it's worth mentioning again. Your cakes need to look as good as they taste. If you can afford it, hire a professional photographer to take photos of your cakes. Investing in top-quality photographs is the one of the most effective ways to grow your cake business. Personal Facebook profile: Sharing products on your Facebook profile is very effective. In fact, studies show that over 62% of people read these kind of posts, so it's a definitely worth doing to help get things going. If you do use your personal Facebook profile to promote your baking business, make sure you add the URL to your Mums Bake Cakes shop so that your customers can order direct. The last thing you want is for people to contact you in the middle of the night! Facebook Page: Facebook Pages are designed for businesses and brands. Facebook wants you to promote your business through your Facebook page, which is why you should keep business promotion through your personal profile to a mimimum. Paying for a Facebook Ads campaign can be a cost-effective method of getting your cakes in front of more people, but if you don't target the right audience you'll be throwing your money away. If you set up a paid campaign, you should make full use of Facebook's many audience targeting options. Running competitions on Facebook can generate huge interest and help drive a lot of sales, so it's definitely a marketing strategy worth considering. Simple competitions can be handled manually; if you don't have the time to organise a viral giveaway yourself, a service such as Vyper may be the better option. If you do decide to run a competition, make sure the contestants are fully aware of your terms and conditions. Trusted information: Display a copy of your registration certificate on your Facebook page, and don't forget to let your followers know about all the types of cakes you bake. If you have a food hygiene certificate, make sure you display that too. Twitter: Set up a Twitter account for your brand and use it to promote your products. You shouldn't just broadcast sales messages though. Use the opportunity to share baking tips, recipes, photos, baking equipment reviews and anything else you can think of. YouTube: Set up a YouTube channel for your Mums Bake Cakes shop. YouTube is the second largest search engine in the world and is a huge source of traffic for many bakers. Use your YouTube channel to demonstrate your culinary skills and offer baking tips and you'll likely see a lot more orders as a result. Business cards: Get a few business cards printed with the details of your Mums Bake Cakes shop on them and hand them out whenever possible. It might be old school, but it's still an effective way to generate awareness. 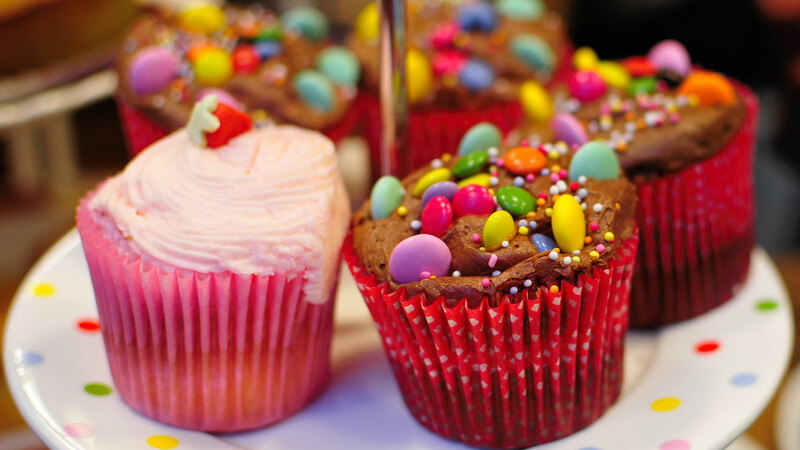 Fairs and markets: Exhibitions, farmers markets, craft fairs, wedding fairs and fetes are excellent places to sell your cakes (especially cupcakes). Check your local newspaper to see if there are any events near you. Hiring a stall shouldn't cost too much, and it's a great way to meet new people and potential customers. Just don't forget your business cards and cake samples! Facebook Groups: Joining Facebook groups and getting involved in the conversation is a very effective way to get your business noticed. Focus on helping others rather than promoting your products, and you'll soon find that people want to find out more about you and your business. Networking: there's no better way to get the word out about your cake business than with a little networking. Use every available opportunity to connect with other people in your community. Hotels: Visit the local hotels in your area and offer to supply them with free cakes in return for a bit of publicity. Hotel guests are an ideal audience to target as many of the guests will be from outside the area. Partner with local businesses: Partner with other local businesses to mutually promote your products and services. Maybe you could persuade a local estate agent to hand out a complimentary box of gourmet cupcakes when they buy or sell a property for a client? As always, don't forget to include a business card and the URL of your Mums Bake Cakes shop. Personalised cakes: The Mums Bake Cakes website has the facility to enable customers to upload a photo, which can then be printed onto the cake. Allowing your customers to personalise their cake is a sure-fire way to increase sales and benefit from repeat business. Stand out from the crowd: Use your culinary creativity to come up with a cake that's completely different to anything else available online. It could be a crazy novelty cake, a cake with an unusual flavour...it could even be a special diet cake! The only limit is your imagination. Reach out to influencers: Why not send out free samples of your finest cakes to food journalists, bloggers and local newspapers. If they like them and review them, you're likely to get a lot of additional publicity. Ask people what they want: When you deliver your lovely cakes, try to find out more about the recipient's likes and dislikes. Feedback cards are a brilliant way to do this, as you can collect their details for marketing purposes. Just make sure you're GDPR-compliant! Although the majority of self-employed bakers operate as sole traders, setting up a limited company is sometimes a better option. You're likely to pay less personal tax if you're the director and shareholder of a limited company than you would as a sole trader, which could help you take home more of your earnings. Running your business as a limited company also means you have the reassurance of "limited liability". This means that, unlike sole traders, you won't be held personally liable for any financial losses made by your business. A limited company can therefore give you additional financial protection should things go wrong. Setting up a limited company for your home-based baking business can make it look a bit more professional and can make it easier to protect your business name. So although registering a limited company for your baking business is more expensive and a little more complex than setting up a sole trader, there are some advantages to be had. Choosing a name for your cake business is one of the most important decisions you'll make, whether you register a limited company or start up as a sole trader. The name you select has numerous branding and marketing implications, so it needs to be carefully considered. The name of your home-based bakery needs to be memorable and convey the right message to your target audience. Companies House has a list of sensitive words and phrases that cannot be used in a business name, and the Companies House website has as a useful tool for checking the availability of a business name. You should check your name’s availability online too. The last thing you want is to spend time building your brand, only to find that there is already a baking business with the same name as yours. Every limited company requires at least one director, but they can have more if required. In fact, there’s no limit on the amount of directors a limited company can appoint. All company directors must be over 16 years of age, and their responsibilities can include everything from marketing to bookkeping. There are also a number of legal obligations for company directors; failure to follow them can result in heavy fines. Once you’ve decided on a name for your new cake business, the next thing to do is incorporate it as a limited company. You can register a limited company on the Companies House website or through a number of company formation agents. Some accountants will even cover the cost of incorporating a limited company as part of their accounting packages. If you have set up a limited company or partnership, you are required by law to have a business bank account. Choosing the right accountant is an important business decision, so it's vital that you do your own research and choose an accountant that's most suitable for your business. So how do you know if an accountant is a good fit for your business? The following assessment questions will help you evaluate an accountant and decide whether or not they're a good fit for your baking business. Does the accountant have experience of helping cottage industry businesses? Look for an accountant who can demonstrate the skills and knowledge required to of support a small business. What are their qualifications, and are they regulated by a professional body, such as the Institute of Chartered Accountants in England and Wales (ICAEW)? Ask the accountant if they can provide testimonials from clients similar to yourself. Even better, ask if you can meet them to get their opinion directly. Find out how much their services will cost, and when they will bill you. Some accountants bill annually or monthly while others charge by the hour. Get baking with Mums Bake Cakes! Starting a baking business from home isn't difficult - it just takes a bit of time and effort. Mums Bake Cakes makes it quick and easy to sell your cakes online. There's no domain to register, no hosting to purchase, no complicated eCommerce platform to install. Simply register as a baker, upload photos of your cakes and get baking! There's no time like the present! Register as a baker with Mums Bake Cakes and get your cakes in front of the nation!